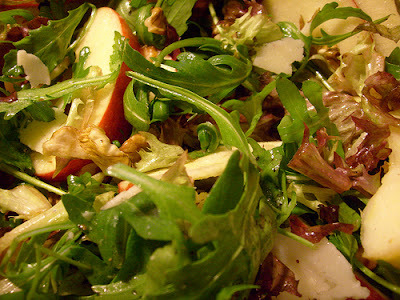 I know, cinnamon raisin croutons...that's a first, but they work deliciously with this salad. The idea came to me when I made a loaf of homemade cinnamon raisin bread that turned out too dense. Instead of tossing it I diced up the loaf and toasted bite sized pieces into crunchy croutons! Gotta give this one a try. Try these croutons with a salad tossed with strawberries and a raspberry vinaigrette too! Whisk all together until well incorporated and chill until ready to serve. Now assemble your salad. Drizzle vinaigrette over prepared salad and toss. Top with your cinnamon raisin croutons and serve!